Wavecut Platforms are well named. They really are platforms of rock created by waves cutting away at the cliffs, leaving just a rock surface at beach level. 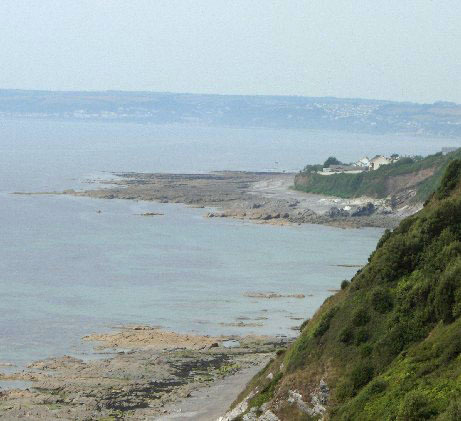 When cliffs are being worn away, the processes of weathering and erosion only act on the parts of the cliff that are above the level of the beach. Once the cliff has been worn down to the same level as the beach, the ability of the sea to continue to erode the remaining rock becomes much reduced. Under the right conditions the continuous erosion and landward retreat of the cliff line produces a wide, flat, area of rock, looking as if the foundations of the cliff have been exposed. 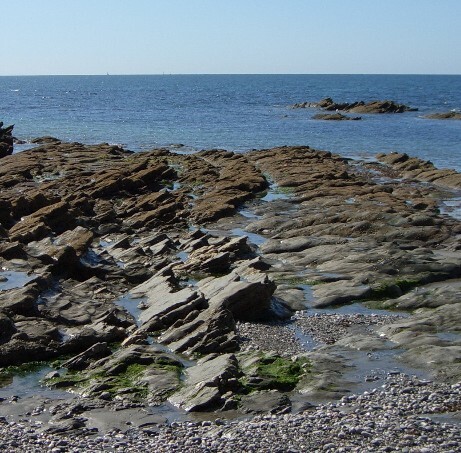 Wavecut platforms are often most obvious at low tide when they become visible as huge areas of flat rock. Sometimes the landward side of the platform is covered by sand, forming the beach, and then the platform can only be identified at low tides or when storms move the sand. Ancient wavecut platforms provide evidence of past sea levels. Raised and abandoned platforms, sometimes found behind modern beaches, are evidence of higher sea levels in the geological past. By using scientific dating methods, or examination of marine fossils found on the platform, it is possible to work out when the platform was formed, thus giving geographers and geologists information about sea levels at known times in the past. In this photograph the wavecut platform is exposed at low tide. The bottom of the image shows the point at which beach material begins to cover the rock surface, hiding the platform further up the beach.The rocks are showing a dip to the east (left side of the photograph) indicating that they have been subjected to folding since they were deposited. Differential weathering has resulted in small channels and ridges forming parallel to each other, running top to bottom of the picture. The channels correspond with weaker strata (layers) in the rocks, and the ridges correspond to the more resistant strata. Where the rocks are still lying flat as they were when they were deposited a very smooth platform can be formed because all the rock surface is eroded away at the same rate. Here you can see the entire wavecut platform from the top of the cliffs. The more detailed photograph (above) was taken in the bottom left corner of this picture. Halfway up the photograph you can see a wavecut platform extending several hundred metres out to sea beyond the present cliff line. Housing can be seen just above the cliffs, taking advantage of the flat land and added protection from erosion given by the rocks rather than the much softer sand beach out of sight around the corner. In the foreground is another platform. This platform is separated from the base of the cliffs by a narrow pebble beach that now provides material with which winter storms abrade the base of the cliffs, thus continuing the process that formed the platforms we can see today. Here you can see the surface of a wavecut platform that has been exposed at low tide. The constant movement of sediment across the eroded surface has smoothed it, leaving a rounded and flattened surface. The changes in rock colour are due to thermal metamorphosis. 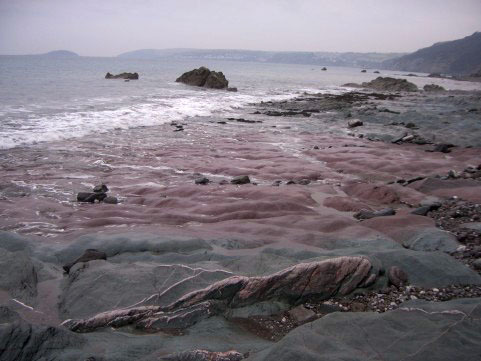 Igneous rocks were injected into a red / brown soft shale baking it and turning it a blue gray colour. The remains of an igneous dyke can be seen as jagged rocks stretching left to right across the middle of the photograph.